Short boardwalk may not be interesting to runners. Just after entering Yellowstone from the West Entrance, either unsigned parking lot for the Two Ribbons Trail makes a fine place to stop. This loop features an accessible boardwalk path that is really a tale of two trails. The first one is a lovely trail along the beautiful Madison River. On the other side of the river, a broad, sagebrush meadow is backdropped by the mountains of the south end of the Gallatin Range. Waterfowl frequently fly and swim through these waters and Osprey and Bald Eagles are common. A few benches provide a place to sit and relax. The second section travels through a young forest, providing an example of the effects of the 1988 burn and how the forest recovers from fires. This section is interesting for its interpretive value but, combined with the nearby traffic from the roads, is less interesting from an aesthetic standpoint. All along the trail, interpretive signs tell you a bit about the natural world that you've stepped into. This content was created by Jake Bramante of Hike 734. Visithike734.com for more expert Yellowstone content and maps that help you decide which trail to hike. 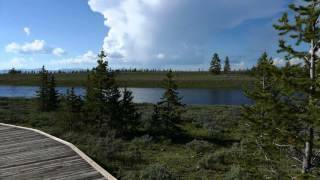 Lodgepole pines and grassland flowers as well as waterfowl and raptors. Megafauna such as bison and elk may also be seen.